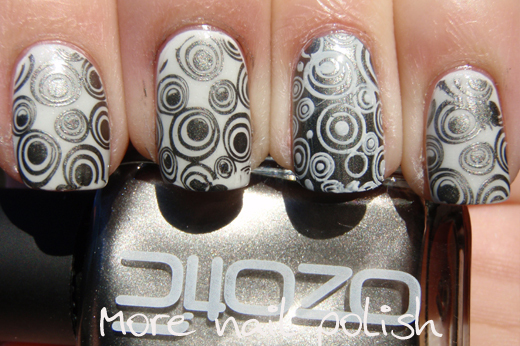 I have another polish from the Ozotic 700 series to show you today. This is Ozotic 761, which as you can see is a metallic charcoal colour. It is a little tricky to apply because it does show the brush strokes a bit, and truthfully, I couldn't see any duochrome shift in this polish at all. But on the up side, this polish was a one coater, which means.... perfect for stamping. 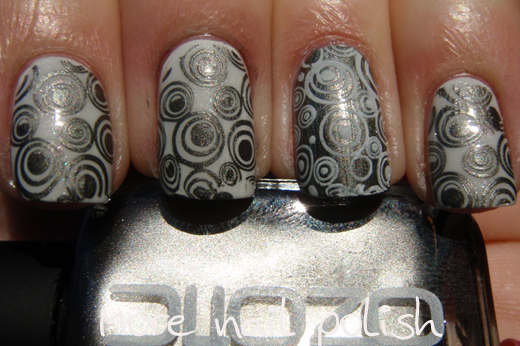 Here is some stamping I did with this polish. I kept 761 on my ring finger and stamped it with Konad Special white polish. On the other fingers I applied two coats of Pretty Serious Forbidden Fruit and stamped it with Ozotic 761. Wowsers, I seemed to take an awful lot of photos of this mani didn't I? One thing I did notice was that Ozotic 761 is nearly the exact same colour as Layla Mirror Effect - Black as Ebony, although the finishes are completely different. 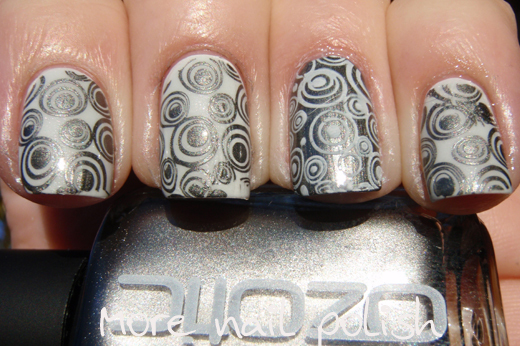 However, Ozotic 761 is eleventy billion times easier to do stamping with than the Layla Mirror Effect polish. In case your new around here and don't know where you can get Ozotic polishes, they are available from Picture Polish or through their many network members around the world. I love your stamping! It looks great! I love this! I'm always looking for good stamping polishes. Some just don't work as well as others. OMG OMG OMG OMG OMG!!! I need this!!!!!! !